Roald Dahl’s deliciously dark tale of Charlie Bucket and the mysterious Willy Wonka comes to life in a brand new West End musical directed by Academy Award® winner Sam Mendes – and to celebrate The Chesterfield Hotel have introduced a wonderful Willy Wonka inspired twist to the Traditional Afternoon Tea Menu. Afternoon tea at the hotel has received the "Award for Excellence" from The Tea Guild for an 'Outstanding Afternoon Tea' for the third year running. 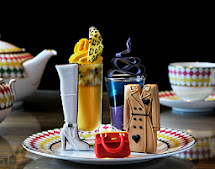 For there new Charlie and the Chesterfield Afternoon Tea they have added Wonka Bars, Oompa Loompa cupcakes, fizzy lifting drinks and candy canes of all sorts to there legendary Traditional Afternoon Tea. And as well as an extensive selection of the finest loose leaf teas you can enjoy hot chocolate and ice cold milkshakes.